Postcard JP-492787 came from the Shimokita Peninsula (下北半島), located in the remote northeastern cape of the Japanese island of Honshū, separated from Hokkaido from the Tsugaru Strait. Shaped like an axe pointing to the west, the peninsula has a thin "handle" in the east connecting to the mountainous "blade" to the mainland. The whole Shimokita area was designated as a quasi-national park (下北半島国定公園 Shimokita-hantō Kokutei Kōen) on July 22, 1968. All Quasi-National Parks in Japan are managed by the local prefectural governments. 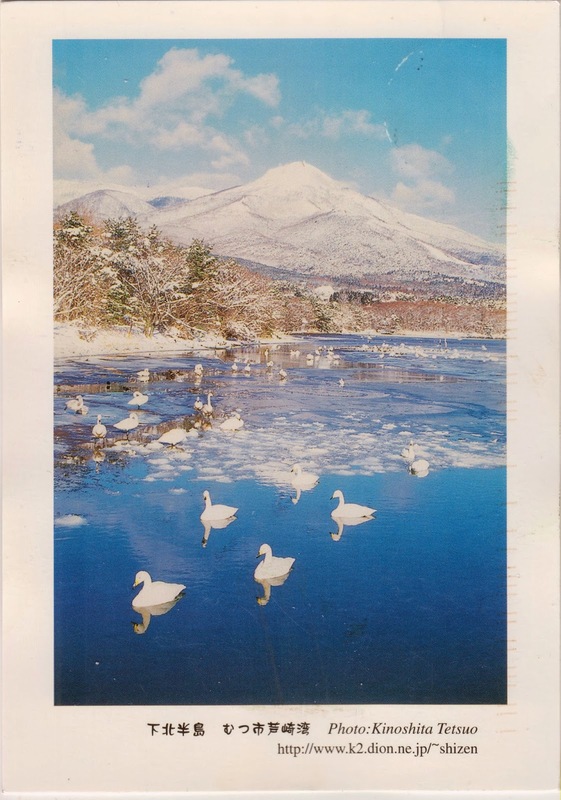 The card shows many swans, migrated from Siberia for the winter, at Ominato Bay inside Mutsu Bay.